FINALLY I have something to add to my fall decor! 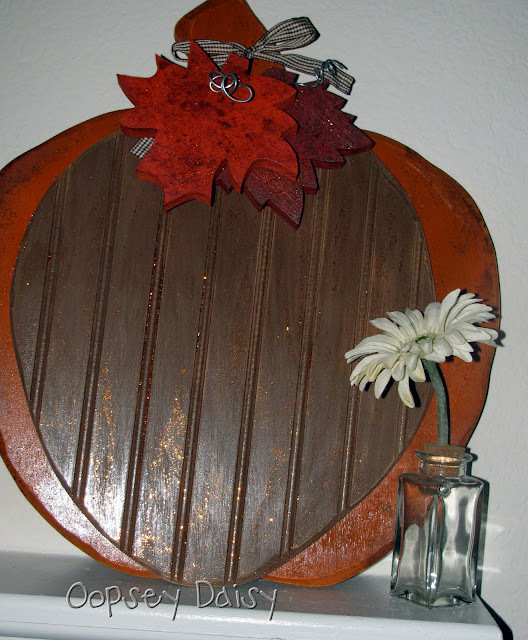 Meet my beadboard pumpkin... my lil' pride and joy! I bought the wood at The Wood Connection--man, I want a jig saw so I can create projects like this without having to cross state boundaries to gather my supplies! I began by spray-painting the beadboard and wood layers and gorilla-glued them together. I hand-painted the leaves with acrylic paint. After letting them dry, I used plastic wrap to sponge darker colors onto the leaves. One of my favorite things about fall is the gorgeous red and orange leaves, so I gave them a lot of tender lovin' care! I threaded them onto the pumpkin stem using wire. There is just nothing happier than curly wire! I curled it by wrapping it around a pencil. I also wanted the pumpkin to look natural. In other words, it needed to look DIRTY. So I sponged some brown acrylic paint around the edges. As a finishing touch, I painted some orange glitter glue over the entire pumpkin. It really made the whole thing pop! A little ribbon was my finishing touch! So now I feel like I can welcome the fall season! You rocked the Summer decorations, so I didn't expect anything less for Fall. Loving this! Ack! Cuteness overload! I love the rustic outdoors look you gave it. Very fun! The pumpkin is too cute!! I love it!! OMG! This is too cute for words! I love it. It would be perfect for linking up to our Fall Decorations link up party, would love to have you join in! 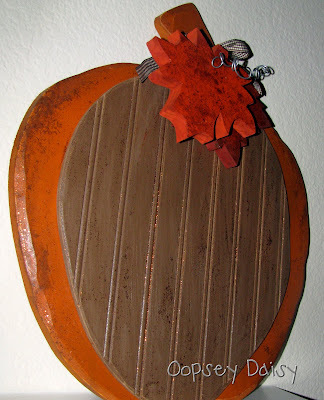 This looks so great for fall, I love the bead board! I think your pumpkin is just adorable. 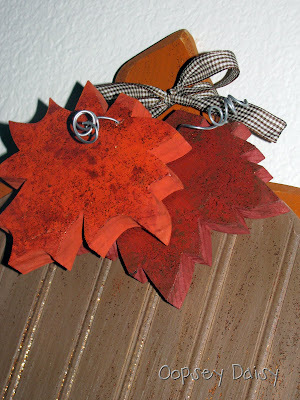 I love these types of fall decorations especially with the hint of sparkle. Just beautiful. wow, what a great idea! it's really so creative! I love these! Maybe it's because I love anything to do with beadboard!! Cute, cute, CA-UTE! Thanks for linking up to Mad Skills Monday! I love this! Its so different! I think the brown on the edges and the glitter was a nice touch. That's such an inventive way to use beadboard! I can't believe how stinkin' cute it came out too! Thank you for joining us at A Crafty Soiree! I hope you'll come back next week and link up again! Don't forget to check out The Halloween Scene at SSB! How wonderful that I was "googling" how to paint beadboard and discovered this…I love it!